30’ wide x 40' long x 12' tall Metal Building with 1:12 roof pitch. Engineered Plans sealed and Certified to Local and State Codes. Building designed for applicable loads. 1 – 10’x10' Rollup Doors, Commercial Grade. 1 - 3'x7' Self framing metal door with lever lock, insulated. 26ga Colored Walls, 14 colors to choose from. Colored Trim with Gutter and Downspouts, 14 colors to choose from. Base Trim, so oversized slab not needed. 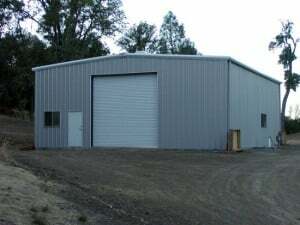 40' wide x 60' long x 14' tall Metal Building with 1:12 roof pitch. 1 - 12'x12' Rollup Doors, Commercial Grade. 50’ wide x 80' long x 16' tall Metal Building with 1:12 roof pitch. 2 - 12'x14' Rollup Doors, Commercial Grade. 50’ wide x 100' long x 20' tall Metal Building with 1:12 roof pitch. Buildings can be designed with Snow Loads, Insulation, Windows, Vents, or any other accessories, you may wish. Contact your local sales representative by phone or email for more information or a customized quote.